These realistic tealight candles are perfect decorations for Christmas, wedding, parties and every night. Comes with a 12-key remote control, you can remotely turn on/off the light, change light colors and switch working modes. Easy to charge with charging base. Compared with real candles, they are safer and more lasting! Realistic Effect: LED tealight candles with flickering colorful lights, which can be put into the frosted cups, look warmer and more lifelike. Remote Control: the 12-key remote control can turn on/off the light, change light colors and switch working modes(stable / slow flash). Changeable Light Colors: white, red, blue, green, orange, yellow, purple and breathing light. Safe LED Source: absolutely no fire hazards or burning risks, safe around pets and children. 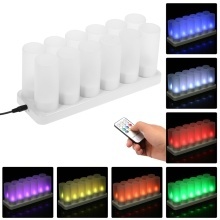 Rechargeable: each candle is built-in a NI-MH battery, they can be simultaneously charged by the charging base. Long Work Time: each candle provide about 10 hours work time after full charge. Perfect Decoration: widely used in hotel, restaurant, saloon or party to raise romantic atmosphere. 1. You can remote control the candle only if its switch is in the ON position(standby mode). 2. The button of candle should be "OFF" when charging. Charging time should be no more than 10H. 3. Do not charge a single candle on the charging base. 4. The candles should be fully contacted with the round pins of the base to avoid short circuit. 5. Lights are not waterproof. 6. Remote control distance may be influenced by angle, light, obstacle, etc. Please control it in normal distance and keep it in horizontal level. 7. The "5Std" key has no function.